It’s halfway through November and I thought for sure I’d have cooked my way through a patch’s worth of pumpkin by now, but alas, I’ve been through only a measly two cans this fall season. I have all sorts of pumpkin-centric recipes bookmarked — pumpkin garlic knots, pancakes, mac ‘n cheese — but life is getting in the way. I’ve barely had the chance to cook at all over the last few weeks, and I’m oh-so-sad. Sigh. 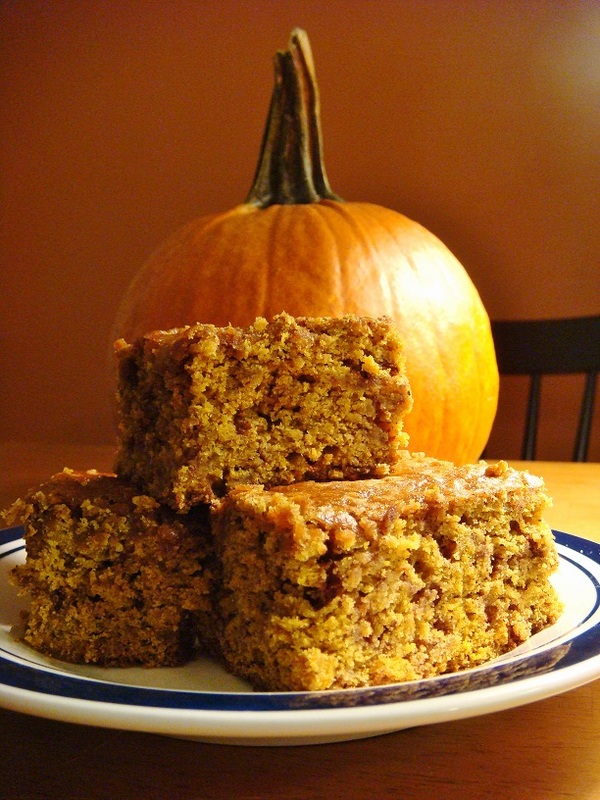 I’ve seen pumpkin blondies with both chocolate and white chocolate chips, but I worried they would overpower the fantastic fall flavors of pumpkin, cinnamon, nutmeg, etc. I opted to use a bag of mini cinnamon chips I purchased from a local candy shop, and was pleased with the little pockets of spice bursting out of each bite. Cream butter and brown sugar in stand mixer. In a separate bowl, combine flour, baking soda, salt and spices. Back in the mixer, drop vanilla and egg and beat well. Add pumpkin puree, and mix until well combined. On low, slowly add dry mix. Fold in cinnamon chips. To make removal and cutting easier, I would recommend placing a sheet of tinfoil inside a 9×13 baking dish (and coat with baking spray). Spread mixture evenly in dish. Drizzle honey, then caramel on top, and bake at 375 degrees for 38 minutes. Makes 24 bars. Cost? $1.69 can of pumpkin puree, $2.99 mini cinnamon chips (not the best price, but worth it for the novelty! ), additional costs if you don’t have ginger, cloves, etc. on hand. Overall success relative to expectations? 9 out of 10. Pumpkin is back with a vengeance, my friends. Five minutes after these blondies hit the oven, I peeked my head in and was punched in the face by a metaphorical fist full of pumpkin spice. Eventually, my house smelled like a Yankee candle — a bargain, considering these are a fraction of the cost and won’t give you wax poisoning if you eat them. The blondies are incredibly moist and make a great group dessert (or breakfast, as I’ve done every day this week). The honey and caramel on top get a slight post-bake crisp to give you a textural variant, and the overall flavors are the epitome of autumn. #PullUpAChair with Food Network’s Virtual Thanksgiving! Pingback: The Food Networks Virtual Thanksgiving – bringing together Food Bloggers to share their favorite Thanksgiving recipes. I took the container you gave me to work and put it out for everyone. Not even kidding – gone in [literally] 30 minutes. All of them. The auditors came out of their room because they could smell them and they took a bunch, then my coworkers ravaged the rest. 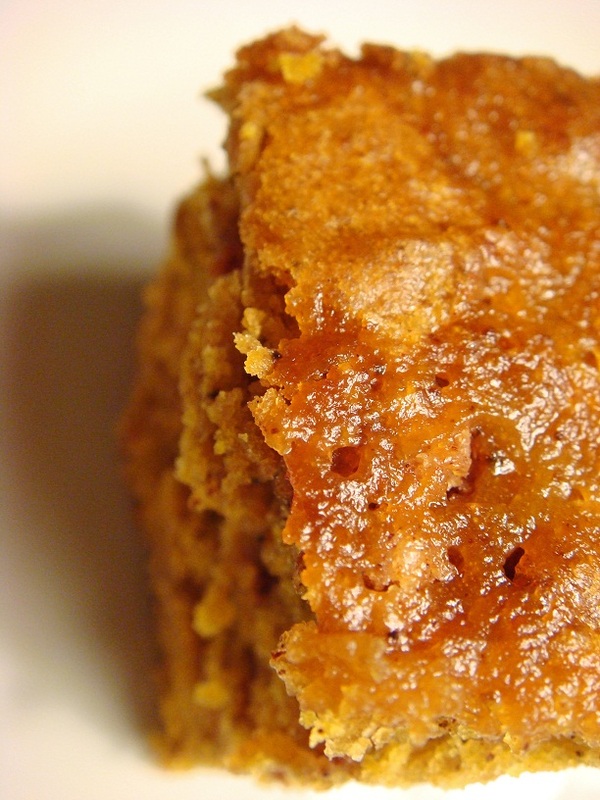 Cinnamon would perfectly complement pumpkin–what a great idea! I like the way you work, eating your masterpiece while writing about it. 🙂 I haven’t baked anywhere near as much pumpkin delights as I had planned on, but there’s still time. You’ve got the rest of autumn and all of winter to try something new, but why wait? Now’s the perfect time for some pumpkin lovin’ 🙂 Thanks for stopping by! Pingback: Eat! Be Mary!, Inc.
Utterly fantastic recipe. Made it for someone’s birthday and everybody LOVED these, the flavors and texture are perfect! I added more cinnamon and ginger, and only had full-size cinnamon chips so I used just over a cup and that’s it, but otherwise kept things exactly as is. Delicious. What a great treat. Pingback: Giving Thanks: A Collective Memory | Eat! Be Mary!, Inc.